and some of the health care option available to you. Our three main methods to fight lung cancer are to Empower patients and providers with access to free educational materials, and resources; to Educate communities about the importance of screening and to share current information with patients and their families; and to Advocate for access to screening and treatment for lung cancer for all communities. Knowledge empowers you to ask the necessary questions to become your own best advocate. When your questions have been asked and answered, you and your health care providers will be in the best possible situation to determine the best treatment approach for you. Thank you for your in your interest in the Caring Ambassadors Focus Groups. We have closed the application process as we received great response from the community. 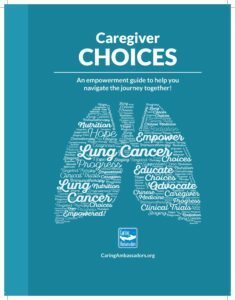 Caring Ambassadors has released Lung Cancer Choices 3rd Edition, an amazing resource for those diagnosed with lung cancer. Caregiver Choices, a resource for all those who find themselves in the role of caregiver for someone who has been diagnosed with lung cancer. Relapse of disease following conventional treatments remains one of the central problems in cancer management, yet few therapeutic agents targeting drug resistance and tolerance exist. New research conducted at the Cancer Center at Beth Israel Deaconess Medical Center found that a microRNA—a small fragment of non-coding genetic material that regulates gene expression—mediates drug tolerance in lung cancers with a specific mutation. The findings, published today in Nature Metabolism, suggest that the microRNA could serve as a potential target for reversing and preventing drug tolerance in a subset of non-small-cell lung cancers. The treatment of lung cancer with personalized medicine has come a long way in recent decades, but still more achievements remain to be seen, said Bruce Johnson, MD, FASCO, immediate past president of the American Society of Clinical Oncology, during his keynote speech opening the Business of Oncology Summit hosted by the Florida Society of Clinical Oncology in Kissimmee, Florida. Though cigarette smoking has reached the lowest level ever recorded among U.S. adults, it still remains the number-one cause of preventable disease and death, accounting for more than 480,000 deaths every year, or about 1 in 5 deaths. Lung cancer alone is responsible for 29% of cancer deaths, more than those from breast cancer, colon cancer and prostate cancer combined. Health Take-Away: Lung screening is recommended for smokers, those who quit. A lung cancer risk prediction model identified patients at high risk for lung cancer who could forgo annual low-dose CT screening for a specified amount of time, potentially augmenting current lung cancer screening guidelines. The study results were recently published online in JAMA Network Open. Pembrolizumab monotherapy extended OS compared with chemotherapy among elderly patients with advanced non-small cell lung cancer, according to results of a pooled data analysis presented at European Lung Cancer Congress. Martin Reck, MD, PhD, head of the department of thoracic oncology at Lung Clinic Grosshansdorf, discusses the rationale for the IMpower150 study, which assessed the combination of atezolizumab (Tecentriq), bevacizumab (Avastin), and chemotherapy in the first-line treatment of patients with nonsquamous non–small-cell lung cancer (NSCLC). Prof Chung Hyun Cheol gives a press conference at AACR 2019 on the data from two separate KEYNOTE trials that showed anti-PD-1 monoclonal antibody pembrolizumab was a benefit to patients with advanced small cell lung cancer. NEW YORK — This year’s HemOnc Today New York meeting kicked off with a session dedicated to treatment advances and challenges in lung cancer.